Located on SW 72nd St. between Don Shula Expy. and SW 87th Ave., Extra Space Storage serves Miami residents near Sunset, Glenvar Heights, Dadeland, and South Miami. Locals will recognize our facility next to Groves at Sunset Apartments and Sunset West Shopping Center. We're also accessible for residents of nearby apartments and condos, such as Groves at Sunset Apartments, Sunset Apartments, Silver Palms at Dadeland, Paradise at Dadeland, Pearl Dadeland, Imperial at Kendall, and Downtown Dadeland. With a variety of storage units and amenities like climate-controlled storage and vehicle storage, Extra Space Storage on SW 72nd St. is the storage partner for you in Miami! No matter what you plan to store, our Miami storage facility has the space you need! Units are available as small as 3x4 and as large as 15x26 with features like indoor access, drive-up access, and more. At Extra Space Storage, we're dedicated to providing a safe environment for our customers. That's why our SW 72nd St. storage facility has 24-hour video surveillance and electronic gate access. Protect temperature-sensitive belongings with climate control. This amenity keeps your unit between 55 and 80° year-round, protecting your items from Miami's heat and humidity. Climate-controlled units come in sizes 3x4 to 10x30. Need to store a vehicle in Miami? Extra Space Storage offers 10x10 to 15x26 drive-up units and 10x20 outdoor parking spaces that can accommodate cars, motorcycles, boats, and RVs. Looking for large storage options for commercial inventory, materials, or equipment? 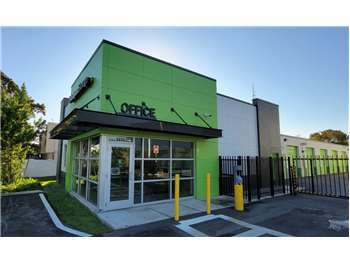 Our SW 72nd St. location has warehouse space that's perfect for business needs. Contact our staff to learn more! At Extra Space Storage, we provide high-quality, reliable self storage with excellent customer service. Not only is our facility clean and secure, but our friendly, professional staff genuinely cares that you have a great experience with us. Contact us today to reserve a storage unit in Miami! awesome staff, very helpful, no tricks, easy going. I'm at about twenty or so years at this facility. It's always clean, great lighting, and well maintained. All the staff is terrific, particularly Margie! She's consistent, always helpful, always professional. ExtraSpace is awesome! Great customer service. Great promotion. Fast service. I was very impressed with Extra Space Storage. The store and surrounding area was clean, the employees very communicative and helpful, and I am very pleased with the services I received. The prices and promotions are good and overall I am extremely happy with how easy and fast it was for me to come in and be greeted with such fantastic service. Espectacularmente fácil mi experiencia con Extraspace storage. Era lo que yo esperaba. Se cumplió mi expectativa. Margie and Jose are the best! So friendly and helpful. Top notch! So glad they are there to help out. Place is well maintained. I highly recommend this place for your storage needs. the people are very friendly specially Margie who goes above and beyond for her customers. I am very happy I found this place . and your items are very well stored and kept safe. it is clean very easy to get to very nice employees very close to my job very inexpensive and the right size. I am very pleased with what I am getting for the money. No complaints whatsoever with this Extra Space location. Walked in on day 1 and had a unit within 10 minutes, long gate hours made it easy to make multiple trips to and from the unit, and very convenient driving to the unit to pick-up/drop off. I would rent here again. I have been at Extra Space for over 10 years and have been continuously delighted with the management staff, Margie. She has always been very helpful in providing the best solutions for my storage needs, both personal and professional. I have recently decided to move into the newer units as an upgrade from a smaller unit and Margie was very helpful in assisting me figure out what size would fit my needs the best. The new units are very clean and bright and I look forward to continuing to store my goods with Extra Space! I had my stuff in storage for three months, now I have a roach infestation in my new place, in my car, my ex-husband's brand new BMW SUV, as well as in The loaner car of a friend who help me move... Luckily she returned it and has her roach free car back... Threw my mattresses away.. Still have stuff in storage been scared to go get it! They are so helpful at this Extra Space Storage. They really want to help you and are just so friendly and personable. I am so happy that I chose this Extra Space Storage. I have been renting at this facility for the past 2 years and had used 2 different units. The manager and the office staff is super friendly, diligent and trustworthy. They are on top of things , if there is any problem, they makes sure the client knows about it right away. The facility is organized, clean and accessible and the units are clean and pest free. I am very pleased with their service and I do recommend them. I normally don't write online reviews. However, the experience I have had at the Extra Space Storage facility at the 8890 SW 72nd St, Miami Florida location has been so outstanding that I just have to share my views. First of all, this location is SAFE and SECURE. It's in a good neighborhood and there are 24-hour surveillance cameras all over the place. Second, this location is CLEAN. It's literally spotless. I have never seen any litter anywhere on the facility or any evidence of rodents or insects. The lady running the facility runs a tight ship. I've even seen her get on her staff right away whenever anything has been out of place on the surveillance monitors. Which brings me to my third point, CUSTOMER SERVICE. The team running this facility is truly 5-star and they take pride in what they do. The main lady running things has been doing this for a long time. I've dealt with other storage facilities where I've been treated like a nobody, which hasn't made me feel safe about my belongings. Not here. This team values their customers and they really go out of their way to take care of you. I highly recommend this facility to anyone looking to store their belongings or even their car, truck or boat. You will have peace of mind about your property at an inexpensive rate. They are truly top-notch and a pleasure to work with. This storage facility is convenient and the staff is helpful and friendly. My facility on 72nd Street in Miami, FL has been excellent. I have had great service and my unit has been safe and dry. I checked my unit the day after heavy down pours of rain, and my unit was completely dry. Thank you for providing great service and a great unit as well. I had gone to another ExtraSpace but they did not have a storage that I wanted, so I went to this ExtraSpace just down the street and inquired about getting a storage space. It was already almost closing time, but Margarita and Danny were very friendly and took their time to help me get the space I wanted. Margarita showed me several sizes/prices on the computer and took me to go see the spaces via golf cart. I was very satisfied with the facility and the service. I was very pleased with the storage space that Margarita ended up showing me, and she proceeded to doing the paperwork right away for me. They explained everything very thoroughly, answered all my questions, and didn't mind that it was past closing time. Overall, this was a great experience and I love the facility. I like that it's just one floor, a lot of the spaces are climate controlled, and they are easily accessible. Great place, cool staff, I definitely recommend this place :-). I have been renting at extra storage space for many years now . Margarita and Danny have always been extremely helpful and friendly. The facility is always well kept and has great security. I am very satisfied with my overall renting experience at this location. As a manager of a team of sales professionals, I have the need to use many storage facilities. The staff here, Margarite and Danial, were very helpful. They worked with me with over 5 different units or spaces over the past 3 years and I appreciate their professionalism. I will come back again and again. Very clean and accessible. Convenient location and friendly staff.